Kofi Amoo-Gottfried’s rise at Facebook is fueled by a passion for broadening access to the Internet. When Kofi Amoo-Gottfried ’01 arrived on the Macalester campus from Ghana in 1997, he had never used the Internet. Today he works in the very center of that world, as head of brand and consumer marketing for the social media behemoth Facebook. 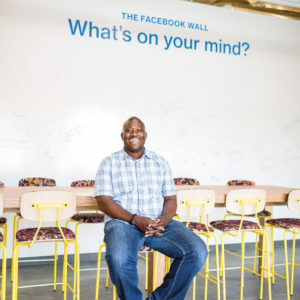 His 20-year journey has included a surprising summer internship, many years as an ad man, and several journeys back to Africa to share his skills and knowledge—all of which ultimately brought him here, to Facebook’s sprawling campus overlooking a flat, marshy section of San Francisco Bay near Menlo Park. It’s a long way from Accra, as Amoo-Gottfried is the first to concede. But Facebook’s mission—to open up and connect the world—fits well with his own values. Indeed, until he was named to his current position—replacing fellow Mac alum Rebecca Van Dyck ’91—he was head of consumer marketing for the company’s internet.org division, which has as its goal to help connect the millions of people around the world who lack Internet access. In his 15 months with internet.org, Amoo-Gottfried traveled to India, Nigeria, Ghana, South Africa, Kenya, the Philippines, Myanmar, and other countries to make affordable Internet a reality in places formerly bypassed by technology. By installing Express Wi-Fi hot spots, beaming internet from the sky via satellites and high-altitude, long-endurance planes, and creating something they call the Free Basics platform to lower the costs of Internet access, “internet.org is exploring innovative ways to get the unconnected half of the world online,” he says. Free Basics provides people with access to useful content such as news, employment, health, education, and local information without data charges, using phones and 2G connections. “It’s all really difficult technologically, but there’s an inspiring end in mind for what we’re trying to accomplish for people,” says Amoo-Gottfried. Leo Burnett offered Amoo-Gottfried a full-time job upon graduation and he stayed there for six years before moving on to Wieden + Kennedy, Bacardi, and Publicis Ghana, where he helped build the first Publicis ad agency in Africa from the ground up. Publicis Ghana and Facebook’s internet.org represent two workrelated examples of Amoo-Gottfried making contributions around the globe. And although too humble to mention it himself, his former boss Van Dyck lists several of his volunteer commitments, including being a board member for Mindful, a creative agency in Ghana; a board member for Population Services International, a global nonprofit health organization operating in over 60 countries; and an advisory board member for Golden Baobab, which gives an annual award for the best African literature featuring African children as heroes. He is also a key member of Facebook’s diversity initiatives, Van Dyck adds, leading efforts to bring more varied voices into Facebook’s marketing department. When he’s not working—and Amoo-Gottfried describes his hefty 50- to 60-hour work week as “pretty good” for the tech world—he lives near the beach in Half Moon Bay, over the coastal range from Facebook headquarters. He is married to his Macalester sweetheart, Kate Amoo-Gottfried ’00; the couple is raising two sons, Marlowe, 3-½, and Miles, 2. He found Macalester—and ultimately his wife and career path—through his uncle, former UN Secretary-General Kofi Annan ’61—“the more famous Kofi,” as Amoo-Gottfried calls him. Annan is his mother’s twin. In typical low-key fashion, as a student Amoo-Gottfried didn’t tell his Mac friends about his connection to one of the college’s best known alums—until his uncle came to campus in 1998 to deliver the Commencement address. “At first even my now-wife didn’t believe me,” he laughs. Lynette Lamb, a Minneapolis freelance writer/editor, is the former editor of Macalester Today.